Hey look what happened when I wasn't paying attention! There's been a major update on the main site. That certainly picks up the slack of me not having anything to post. 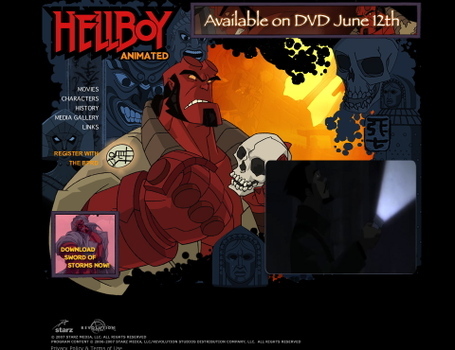 Both DVDs are represented and you can even download Hellboy: Sword of Storms. The only thing the site needs is a big juicy section on The Phantom Claw but that's up to the public and sales. BAHHHH....I need to see blood and ironnn. IN the meantime Ill go check out the revamped site. visited gotohellboy.com, and watching that trailer for blood and iron, reminded me of how much I loved that movie. I can't wait to get my hands on the DVD and the Hellboy figure (from best buy), of course. Here's hoping for The Phantom Claw.